Current approaches to IDaaS on one hand enforce trust of consumer data using legal compliance, risk and impact assessment and the other hand require technical implementation of access controls to personal data held by an enterprise. Balancing trust has to be done across all layers, verifying person’s identities, showing the individual and the service is real, creating short term relationships and verifying and maintaining all long the Cloud service the user mapping between the enterprise and the cloud user account in a mesh federation. This makes sense only if enterprises design “on-premise” with MaaS their own flexible ID data model and can verify ID maturity and consistency before moving, and along, the ID service in the Cloud. Based on MaaS, the BYOID concept is a possible solution to ID models for consent policy design, management and deployment. The BYOID model is a means to expressing, tracing and updating consumer’s personal data policy requirements; however enterprise users’ privacy preferences are provided as well. The IDaaS Maturity Framework (IMF) defines and directs the BYOID practice. MaaS guide properties and personal preferences from the consent metamodel design to the ID deployment. Both ensure that ecosystem compliance is achieved and ID in the Cloud meets trustworthy relationships. – ID ecosystem reliability and adherence to the frameworks’ security criteria that measure service provider(s) compliance. However, the levels of maturity gauged along the organization enables the enterprise to design its own ID as a consequence of the appropriate IDaaS model. The enterprise is able to bring in the ID ecosystem a configurable IDaaS model based on MaaS design to satisfy enterprise business rules. Business rules have impact on enterprise identity requirements and they balance and reconcile consumer identities needs. 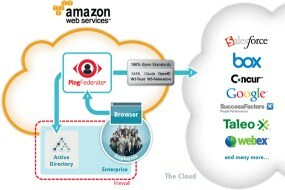 This “fluid” multiple-way enterprises-consumers solution, or BYOID, creates a high assurance level of ID ecosystem participants’ identities that could be used for enterprise access by respecting privacy and security requirements: IDaaS models contain BYOID properties and define “on-premise” BYOID maturity and consistency. When registering to an Identity Platform, users would like represent themselves according to their behaviour having the option to approve selective or discretionary sharing of their private information and looking for the ability to obfuscate, mask or mesh some parts of personal data. So, ID platform and user are creating interactively a bond of trust as a part of the whole ID service. This is possible only if the consent of the individuals, the data protection conditions for processing their personal data and consent policies might be modelled “on-premise” by the enterprise IdM. The above properties are matter for the ID ecosystem public consent data model structure (basic/incoming tables of the BYOID metamodel). In the beginning, those metadata are properties of the company: the company’s BYOID metamodel. 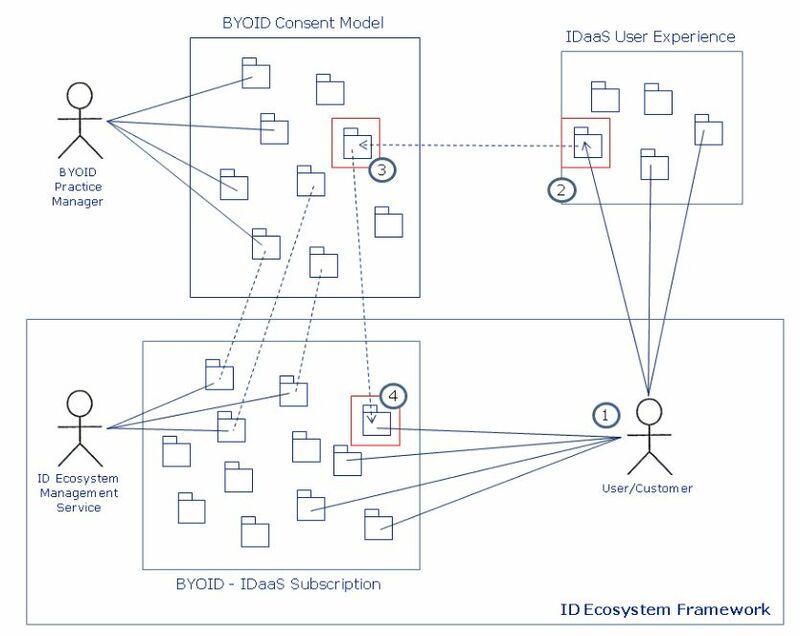 Once the BYOID metamodel has been defined, tested and approved as BYOID company data model, it will be released to the ID ecosystem as an IDaaS model subscription. Despite of different approach, each enterprise may then adopt and release his BYOID. Before deploying BYOID services in the Cloud, the BYOID model should be compared with other BYOID models already running into the ID ecosystem frameworks. To be accepted, BYOIDs have to meet a set of common requirements enforced by the consent public ID ecosystem framework authority: the more adaptive is the public consent model (continuously and rigorously improved), the more flexible, secure and reliable are the BYOIDs shared. It makes interactive, fluid and safe BYOIDs deployed through IDaaS. Still, this enables user’s behaviour can be captured both at high level (enterprise-ecosystem reconciliation) and at low level (personal-enterprise-ecosystem reconciliation). Therefore BYOID can be reconciled, renormalized and constantly trusted at all levels. Since BYOID metamodel contains the enterprise identity requirements, it might include and integrate the ID ecosystem identity properties and, if approved by the user (obligation to maintain the personal data securely), his personal properties. This aspect is very important: in fact, there’s significant risk for a company when both customer/user relationships and company data are stored on personal devices. Using BYOID deployed as an IDaaS subscription, company information is centralized based upon “on-premise” consent metamodels: this means that company information stored on personal devices is minimized and always centrally controlled. User’s personal properties might reside on the same company (central) metamodel/consent model or not depending upon user approval and, always possible, withdrawal (i.e. personal data should comply with data protection legislation and, where necessary, the approval of the individual must be obtained). In the figure 2 here is an example. In 1 the User tries a new behaviour (statistically relevant or as a recommender system outcome); in 2 the IDaaS user experience has to be changed and updated. Above we show 3 data models but in the MaaS representation they consist of a unique model containing the BYOID IDaaS subscription (master) that includes 2 sub-models: the company consent model and the user personal model. In 3, the consent model is modified to keep compliance with the company business rules/conduct mapped to the BYOID IDaaS subscription. In 4, finally the update is executed and the User might find his conduct as a new function. However, take note in the figure 2 a relational model-like formalism is applied. This is just a simplification. In effect, we are in a multi-level relational data model that can be represented with NoSQL, Vector or Graph DB else, depending upon the data analytics domain. IDaaS models to move ID to the Cloud enable organizations to externalize identities data more knowingly and securely. Employees and customers behaviour changed: they continuously have business contacts, calls and meetings with personal devices. Since an increasing quantity of employees uses their mobile devices everywhere, identities can be resident and so associated to applications running on different framework in a multi-topology cloud configuration. What should be then the best IDaaS model satisfying this new employees/customers conduct? Could be managed all users, across multiple locations, while securing company data? Because of each identity may be managed by different identity management services, authentication and validation of identities by the cloud infrastructure could not be sufficient. Companies have to verify and control “on-premise” their ID maturity. BYOID based upon IDaaS models allows to identifying and securing identity properties. 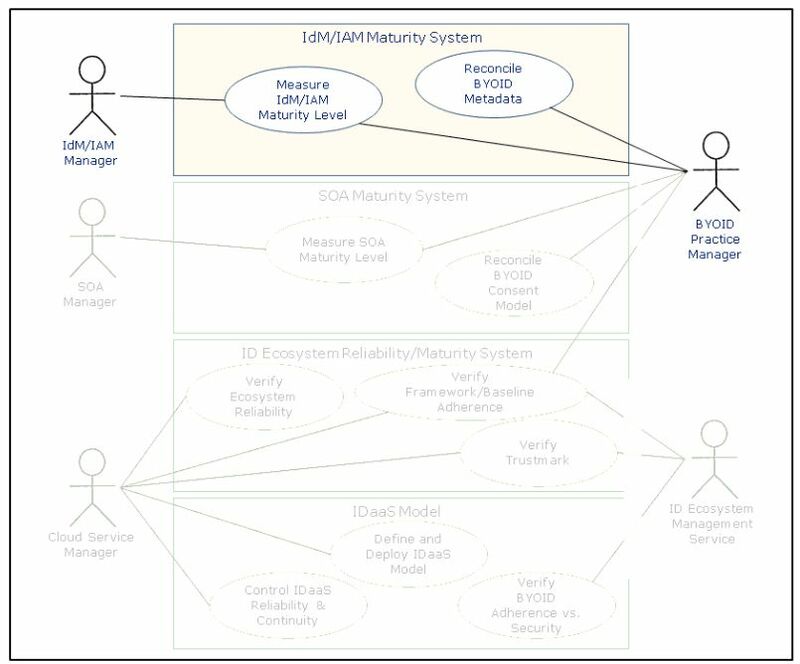 Further IDaaS models assist ID integrity control over shared topologies with a variety of ID ecosystem frameworks. IMF plays a crucial role in identifying the most appropriate IDaaS model before deploying the BYOID to the Cloud. Then the BYOID is an IDaaS model and can be designed “on-premise” and controlled along deployment and subscription. 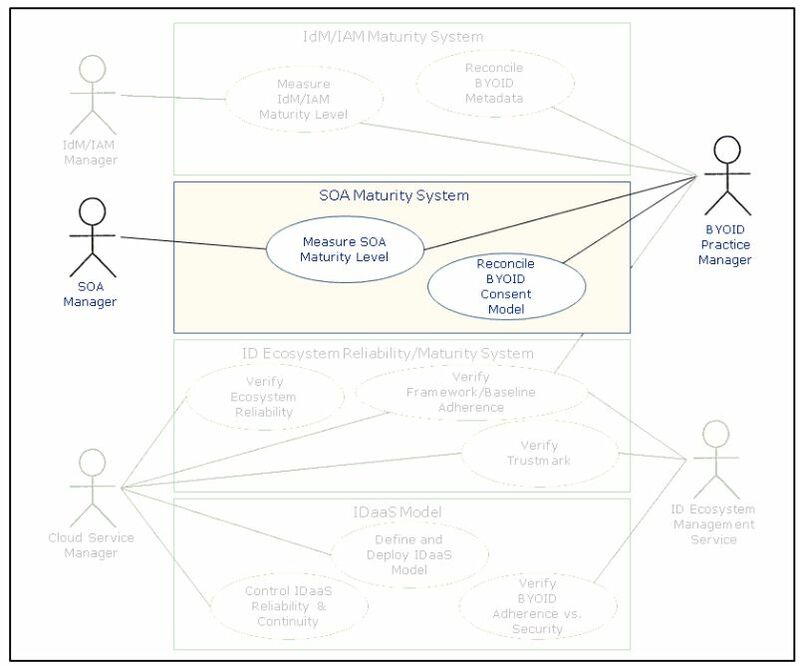 Identity Ecosystem reliability/maturity: measure the ecosystem maturity/reliability, and above all, the secure service continuity because in hybrid topologies identities may be owned by different cloud providers resident in multi-topologies. Periodically measure the organization’s IdM/IAM and SOA maturity levels and verify the ID ecosystem reliability/maturity so to update, and eventually scale, the BYOID deployed. – Contribute to the IDaaS Trustmark definition and to the periodical appraisal and updating. The BYOID Manager reconciles BYOID metadata and update the BYOID metamodel. The IAM Manager controls if users’ identities can be extended beyond corporate employees to include vendors, customers, machines, generic administrator accounts and electronic access badges, all ruled by policy controls. policy for SOA appliance and governance. The BYOID Practice Manager tests and executes BYOID consent model reconciliation based on metamodel reconciliation and update. If necessary, BYOID Manager renormalizes the consent model by roundtrip with the BYOID metadata at IdM/IAM maturity level. 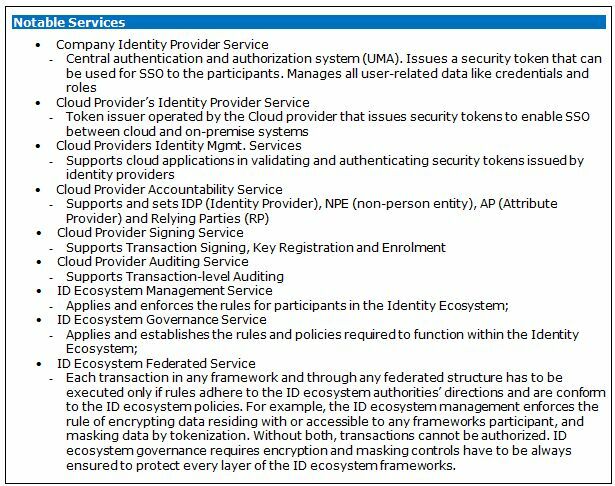 The ID Ecosystem Management Service verifies BYOID adherence and security with respect the IDaaS subscription. 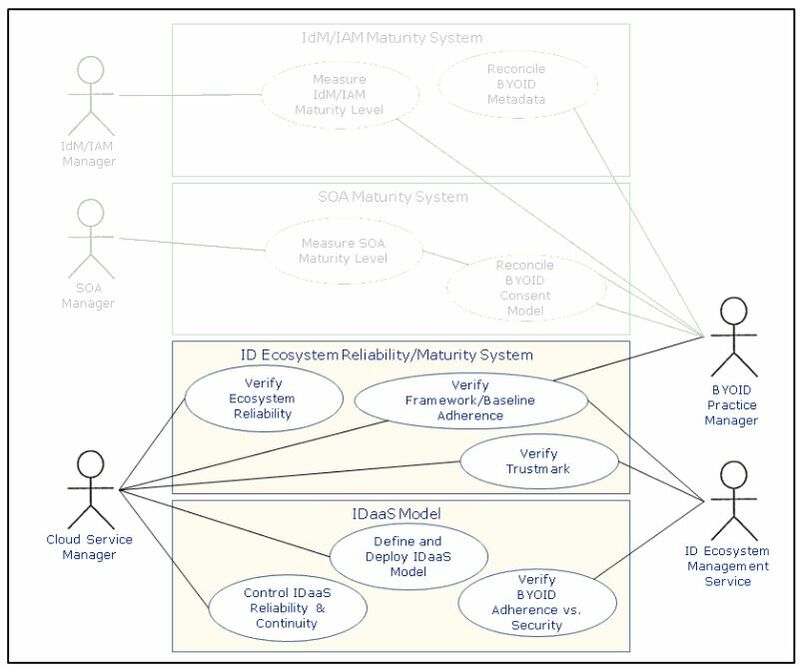 The ID Ecosystem Management service provides a combination of criteria to determine the service providers’ compliance among frameworks and ID ecosystem topologies: the combination defines policies, rules and, eventually, a Trustmark. It gives confidence to participants in deciding who to trust in terms of BYOID framework adherence and among all ID providers. Managing digital identities across ID ecosystems frameworks is crucial to improve efficiency of business collaborations. Using everywhere personal devices is becoming a preferred conduct but before sharing the ID among cloud domains, all involved parties need to be trusted. Still, to meet the demanding needs of security, big data analytics and business intelligence, users and consumers need a more efficient and flexible paradigms. In this paper, we identify how BYOID fluid model satisfies on one hand company security and user data protection and, on the other hand, rapid updating and reconciliation to the user conduct. IMF provides the necessary platform for collaboration in ID ecosystem topologies. We introduce also a USE CASE to point out how BYOID built across ID company consent model and ID ecosystem trusted access model, can be a foundation to gauge and govern BYOID strategies. Further, the paper can be used to compare different BYOID IDaaS subscription to establish what maturity levels the company might support compared with all business partners running existing IDaaS maturity models and to ensure ID in the Cloud meets trustworthy relationships. I have to sincerely thank Susan Morrow for the precious feedback on contents and Anil Saldhana for the useful comments on the IDaaS Maturity Framework. Disclaimer – This document is provided AS-IS for your informational purposes only. In no event the contains of “ID Consent: applying the IDaaS Maturity Framework to design and deploy interactive BYOID (Bring-Your-Own-ID) with Use Case” will be liable to any party for direct, indirect, special, incidental, economical (including lost business profits, business interruption, loss or damage of data, and the like) or consequential damages, without limitations, arising out of the use or inability to use this documentation, regardless of the form of action, whether in contract, tort (including negligence), breach of warranty, or otherwise, even if an advise of the possibility of such damages there exists. Specifically, it is disclaimed any warranties, including, but not limited to, the express or implied warranties of merchantability, fitness for a particular purpose and non-infringement, regarding this document use or performance. All trademarks, trade names, service marks and logos referenced herein belong to their respective companies/offices. Building metrics to decide how and whether moving to IDaaS means considering what variables and strategy have to be taken into account when organizations subscribe identity as a service contracts. Before moving any IdM to the Cloud, organization should balance costs and risks. Accordingly, metrics adopted should be enough flexible to be applied from both a company that is developing an IdM system and a company that already has a IAM in operation but is considering to move the ID to the Cloud. The metric introduced below is included into a coming IDaaS Best Practices helping companies to understand, evaluate and then decide if and how moving ID to the Cloud. 2.3 System protection (perimeter defence, audit and surveillance). – Adherence to the criteria that measure service provider(s) compliance with the identity ecosystem framework. 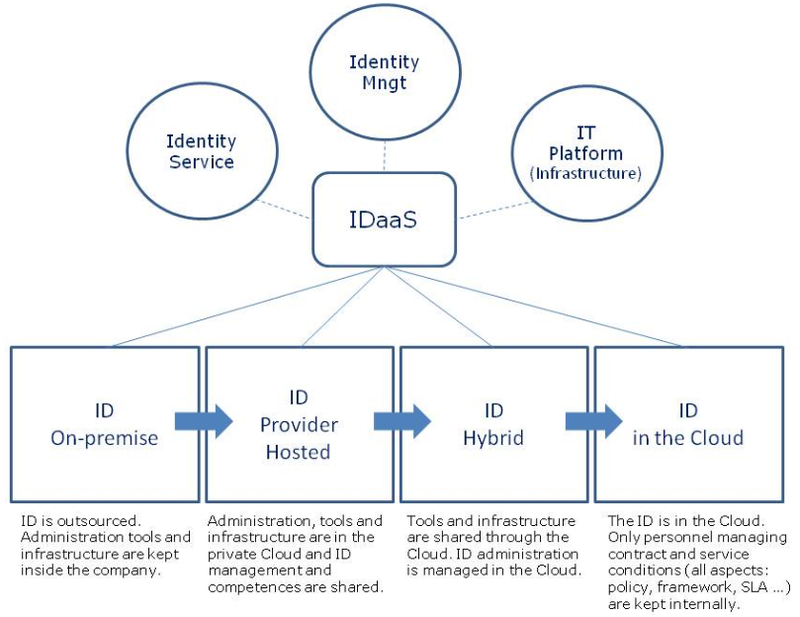 3) ID Hybrid – IDaaS is in the Cloud although sensitive information is yet managed internally. ID Hybrid means subscribing private, community and/or public Cloud services. Tools and infrastructure are shared through the Cloud. ID administration is managed in the Cloud. 4) ID in the Cloud – The ID is in the Cloud. Only personnel managing contract and service conditions (all aspects: policy, framework, SLA …) are kept internally. These aspects are important on one hand considering what risk (and countermeasures) may be taken when moving the ID to the Cloud and on the other hand which takings could be expected in terms of cost savings. 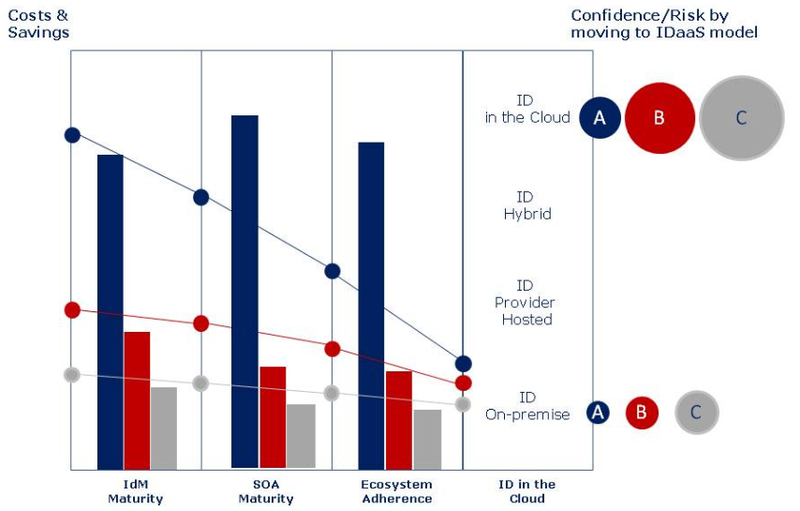 Companies have to balance the real business value of the risks based upon on-premise ID maturity and the eventual cost reduction, model by model. 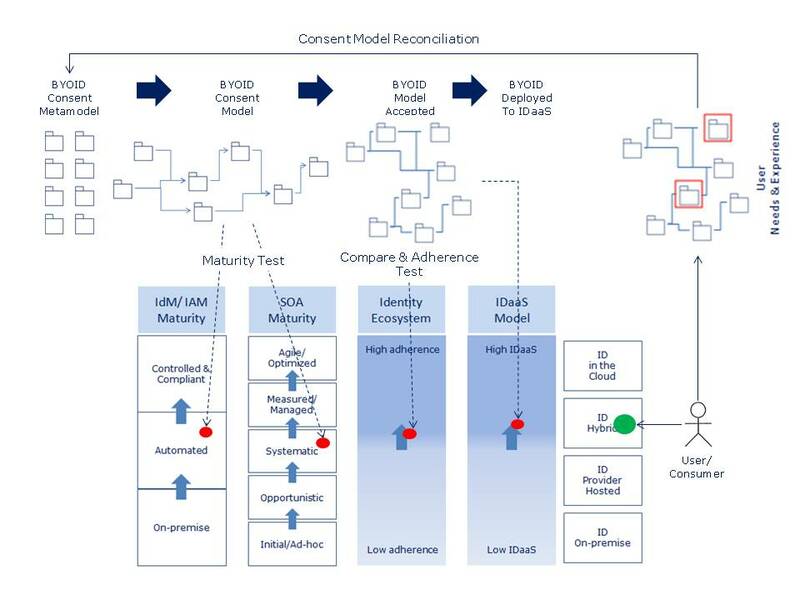 In the following picture, an example shows how 3 companies having 3 different levels of maturity for IdM, SOA and Ecosystem adherence, meet 3 scenarios in term of Cost/Saving and Confidence/Risk when decide to move to IDaaS. Company A – Company A manages advanced projects to implement and maintain high levels of maturity for IdM and SOA. Still, attention is paid to the Cloud identity ecosystem: the Company applies specific criteria to assess services provisioning in the Cloud. 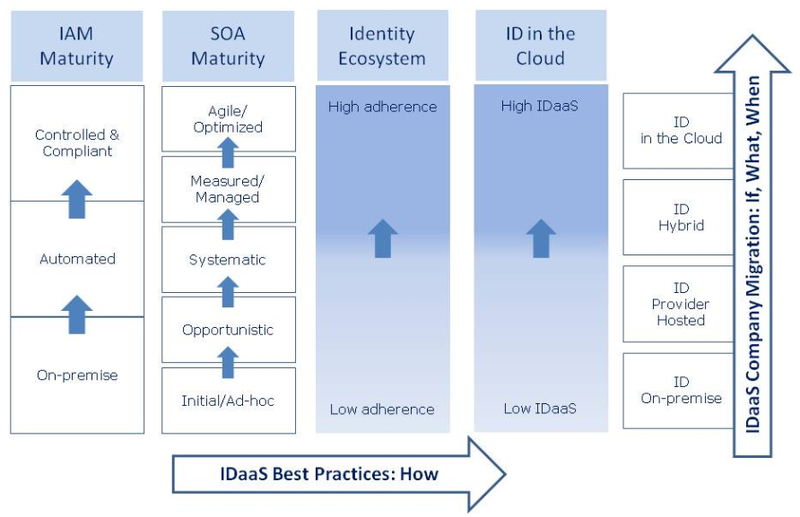 By applying IDaaS Best Practices based on Maturity levels, Company A might moderate the risks if decides to move ID in the Cloud. Criteria to adopt Cloud services are enough stable to manage on-demand and full provisioning IDaaS. Cost saving is another aspect should be taken into consideration. By externalizing IDaaS, the expected savings might be impressive (about 70% of CapEx invested) and, in this case, moving to the Cloud can be balanced with a path that further moderates the risk. Company B – Company B has an intermediate maturity and work in progress projects through the IdM and SOA implementation. The ecosystem interface knowledge also is increasing although it is not yet disciplined. 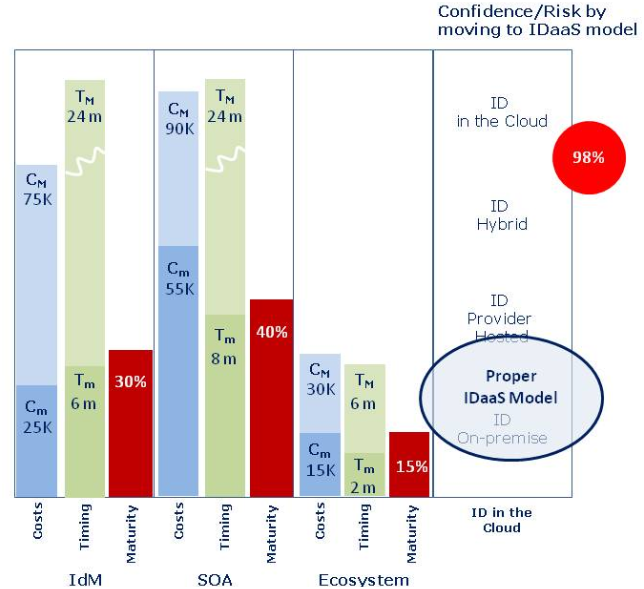 Confidence to move ID to the Cloud is low with respect the Company A and the risk is growing with the above IDaaS models. Considering the CapEx to implement internal IAM and BPM procedures, IDaaS cost saving is lower (about 30% of CapEx invested) then Company A. Company B should mitigate the risk by moving to the appropriate IDaaS model. The right path to subscribe IDaaS should be starting from the most proper IDaaS model to progressively increase levels of maturity. – how is employed transparency into cloud operations to ensure multi-tenancy and data isolation (IdM and ID ecosystem). 2) moving in any case ID to the Cloud being aware of the risk by trying to balance IDaaS cost saving (OpEx) benefit and Cloud environments introducing transient chains of custody for sensitive enterprise data and applications. N is the number of maturity ranges considered (IdM, SOA, Ecosystem …). Could the company accept the risk of 98% in moving to the Cloud with the ID system? What is the main pain looking at the maturity ranges and the risk rates? What is the appropriate IDaaS model could moderate the risk and reduce the costs? The solution in the figure below might be a measured solution to get confidence and awareness before subscribing an IDaaS contract. Companies could apply a systematic approach by adopting the gauge above exploited. The metric can help in deciding whether balancing risks and OpEx advantages is appropriate in subscribing an IDaaS contract forward security and business benefits. Looking at the cost saving for Company C, the above cutbacks could be modest (about 20% or less with respect the actual CapEx) although the ROI would be faster. It depends upon the IDaaS strategy the Company decides to implement. Disclaimer – This document is provided AS-IS for your informational purposes only. In no event the contains of “A high-level IDaaS metric: if and when moving ID in the Cloud” will be liable to any party for direct, indirect, special, incidental, economical (including lost business profits, business interruption, loss or damage of data, and the like) or consequential damages, without limitations, arising out of the use or inability to use this documentation, regardless of the form of action, whether in contract, tort (including negligence), breach of warranty, or otherwise, even if an advise of the possibility of such damages there exists. Specifically, it is disclaimed any warranties, including, but not limited to, the express or implied warranties of merchantability, fitness for a particular purpose and non-infringement, regarding this document use or performance. All trademarks, trade names, service marks and logos referenced herein belong to their respective companies/offices. Here is the first version of our Canada Cloud Roadmap with inputs from contributing expert authors. We will continue to add more great content from a wide range of experts, so that ultimately this document offers a powerful roadmap template for planning an enterprise migration to the Cloud. The Roadmap is also a framework for a channel partner program, where the solution journeys like BYOD will act to organize go to market sales campaigns. Join in – To feature your products and services in this campaign, join in our Roadmap group on Linkedin. Our objective here at the Canada Cloud Network is to build a local forum for innovating global Cloud best practices. For example over here at Sheepdog our goal is to build one of Canada’s premier brands for expert Cloud consulting. Central to this is development of the ‘Cloud Readiness Assessment’, a standardized process for helping your business understand where and how it could best exploit the trends of Cloud computing. The framework for planning the Cloud migration business case can be defined in terms that Forrester Consulting calls ‘Total Economic Impact’ (TEI). Recently Google commissioned Forrester Research to identify the TEI (Total Economic Impact) of moving to Google Apps, polling around 600 mid-sized firms about their collaboration plans. A Cloud Readiness Assessment is a consulting engagement that analyzes your organization and its business requirements, and maps these to a Cloud strategy. The exercise can include some very specific auditing work – For example an assessment of your Microsoft Office licencing situation. In some cases customers find they are paying for versions they aren’t using, in one case yielding $2.5m in annual savings. If this is then followed by the additional cost savings and productivity benefits that Forrester describe, it’s clear how straight forward it is to plan a successful ROI from a Cloud migration. 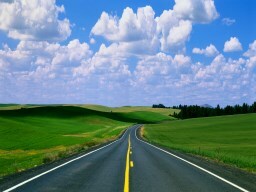 The objective of the Canada Cloud Roadmap is to help flesh out the detail of a number of these journeys. Desktop office software is but one of many scenarios where the same principle and process can be repeated. With each of these different functional areas having their own self-contained TEI, then it’s possible to cherry pick just one or a combination of them, to assemble the Roadmap that best suits your organization. Abstract – MaaS (Model as a Service) sets a new concept to order and classify data modeling design and deployment to the Cloud. MaaS changes the way to move data to the Cloud because allows to define data taxonomy, size and contents. Starting from data model design, MaaS might guide the DaaS (Database as a Service) lifecycle, providing data granularity and duty rules: as a consequence, MaaS implements the new concept of Small Data. In fact, Small Data answers to the need of controlling “on-premise” data dimension and granularity. Anyway, Small Data is not data volume limitation. Small Data affords data modeling full configuration and provides 2 main advantages: data model scale and data ownership that provide assigned data deployment and, finally, data deletion in the Cloud. The inheritance coming from the past imposes to manage big data as a consequence of multiple integration and aggregation of data systems and data movement. Data coming from Social Networks intensive data applications have contributed to blow up the EB containers. Administrating big data is not an option but rather a debt contracted above all with the data management history. Anyway, Big Data analytics seems to be a standard practice in storing massive data. Is there any way to change this norm? Companies have for many years used data models by designing and mapping data, started the change and today manage the “tiller” of their data heritage. Accordingly, Small Data is far from a further catch-phrase: the antonyms with respect Big Data aims to pay attention in changing mind and using data models to design fit, noticeable data systems, especially when data are moved to the Cloud. MaaS implements Small Data, enables Personal Cloud and help to recover, to order and to classify, data inheritance of the past as well. MaaS meets the ever-increasing need for data modeling and provides a solution to satisfy continuity of data design and application. Further, it helps in choosing and defining architectures, properties and services assets looking at the possible evolution and changes the data service can have. MaaS meets scaling and dimensioning in designing data systems, supports scalability and, in particular, agile data modeling appliance. Small Data starts when the dimension of the data system has to be defined and controlled since the description (metadata). In effect, we are improperly speaking of data systems: actually, we are dealing with data services. The Cloud is the great supplier of data services. – Designing multi-data structures to control databases elasticity and scalability. Models contain deployment properties and map the target database service. 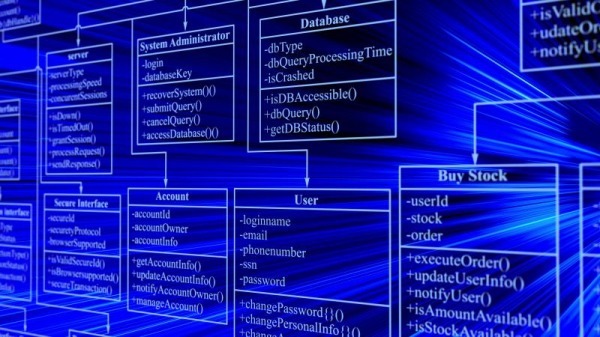 Therefore, the model designs “on-premise” database elasticity and scalability. Still, we will see later that multi-database design is a way to control data persistence. Thus, imagine we have users asking for temporary services to be deployed and, after services have been closed, cancelled. Services satisfying these requirements are based upon data models designed by MaaS agile model techniques, controlled size and contents, fast update, rapid testing and continuous improvement forward the generation of the model/dataset to the target database. Models should set users’ data contents, dimension (for example, to suit to mobile services), data deployment (geo-location, timing …) and to be, on-demand, definitively destroyed. With MaaS, Small Data can be defined since the metamodel design and then implemented, synchronized and deployed to the target by applying the DaaS lifecycle. Of course although, Small Data are placed under size and content control, they can be created and replicated infinitively: is this a further way to switch to Big Data again? 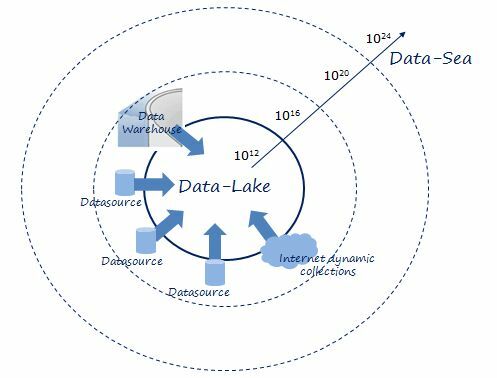 3) Statistically speaking, by applying Small Data the average of data storing coming from intensive data applications (Social Networks, for example) should be computed and standard deviations estimated due to multiple storage allocation and, above all, free. This doesn’t mean the YB is the last order of magnitude of data size the SI has defined. Definitively, MaaS enables service designers to plan, create and synchronize Small Data models from and to any web data source and data management system in the Cloud. Data granularity changes and enables designers to calibrate data models and data services by defining model’s content that allows users to deploy i.e. allocate and then, at the end of the service, to shred the data in the Cloud. This is a new frontier for Mobile services, Open Data and what today might be defined as Personal Cloud. 4) Ownership and data location are linked by relation. Once Personal Data in the Cloud has to be deleted, the Cloud Provider should assure the data are unrecoverable. Looking at data model mapping, data has to be destroyed in the location defined in the Small Data design. Data owners know where the data has been deployed because before opening the data service in the Cloud they may accept or not the location assigned and might ask for a new storage site. 5) Generic personal data in the Cloud regardless they are permanent or temporary stored. Applying MaaS, Small Data can be considered on-premise services because they collect behaviours and information concerning structures (to be deployed in the Cloud), access rights, security and scaling, partitioning and evolution. In other words, Small Data ensure that the behaviour and effectiveness of the released Cloud applications can be measured and tracked to meet user’s needs. Models leverage Cloud data services to enable flexible deployment and therefore enforce Personal Data persistence, storage and geo-location policies throughout the Cloud. Big Data is a consequence, Small Data is a new start. MaaS provides Best Practices and guidelines to implement Small Data and Personal Cloud ownership by starting from data modeling and DaaS lifecycle. We want to underline that Big Data as we know is a consequence of how companies have for many years used, stored and maintained data. Small Data indeed might be a new way to manage data in the Cloud. Especially when personal data are considered, Personal Cloud provides, on one hand, a preconfigured and operational data definition (for example, local information vs. cloud information) and, on the other hand, the details of how to enable provisioning and deployment of multiple storage in the Cloud. Finally, starting from “on-premise” Small Data design, Personal Cloud can be applied and users can have soon an understanding of Cloud deployment, data centre geo-locations and service constraints. YB – Yottabyte, unit of information or computer storage equal to one septillion bytes (1024 bytes). “MaaS implements Small Data and enables Personal Clouds” (the Document) is provided AS-IS for your informational purposes only. In no event the contains of the document will be liable to any party for direct, indirect, special, incidental, economical (including lost business profits, business interruption, loss or damage of data, and the like) or consequential damages, without limitations, arising out of the use or inability to use this document or the products, regardless of the form of action, whether in contract, tort (including negligence), breach of warranty, or otherwise, even if an advise of the possibility of such damages there exists. Specifically, it is disclaimed any warranties, including, but not limited to, the express or implied warranties of merchantability, fitness for a particular purpose and non-infringement, regarding this document or the products’ use or performance. All trademarks, trade names, service marks and logos referenced herein belong to their respective companies/offices. Jennifer Marsh is a software developer, programmer and technology writer and occasionally blogs for Rackspace Hosting. Ruby is an advanced language for many programmers, but it’s a powerful language used to make dynamic interfaces on the web. Dynamic web hosting shouldn’t be taken lightly because security holes still exist. A good cloud web host will offer a safe environment for development while still offering scalability and usability for Ruby programming, testing and deployment. Web applications can grow to several gigabytes. For newer Ruby developers, it’s helpful to have enough storage space for backups, so a backup can be made to support the deployed code changes. Ruby is an interpreted language, but a bug can still mean a lot of time and resources devoted to discovery and fixing. Instead of emergency code reviews, the developer can restore the old version of the application before troubleshooting bugs. In severe cases, the application corrupts the data stored in the database. A good web host will backup the database and then restore it when the site owner needs it restored. This is especially useful in emergencies when the site gets hacked or data is corrupted due to application changes or hard drive crashes. The web host should support the client, including in cases of restoring database and application backups. To run Ruby, the web host must support the framework. Check with the hosting company, and verify the host allows execution of CGI files. A good way to check is to find a host that has FastCGI and specifies that it supports Ruby and Ruby on Rails. Ruby is typically supported by Linux hosts, but some Windows hosts will support Ruby. Ruby is an interpreted language like Java, so it can run on any operating system. Ruby configuration can be a bit hairy to configure. If the programmer is familiar with the language, having shell access helps speed up application configuration. Not all hosts will offer shell access, but with extended or advanced service, most hosts will oblige the webmaster. Shell access gives the webmaster more control of the Ruby settings. The most important part of a web host is customer support an up-time. Most web hosts have a contract with the client that promises a percentage of up-time. This should be around 99%, meaning the website will be up for visitors. Check with the host for contract specifics before purchasing cloud hosting for Ruby. The concept of single sign-on (SSO) is not a new one, and over the years it has successfully bridged the gap between security and productivity for organizations all over the globe. Allowing users to authenticate once to gain access to enterprise applications improves access security and user productivity by reducing the need for passwords. In the days of mainframes, SSO was used to help maintain productivity and security from inside the protection of firewalls. As organizations moved to custom-built authentication systems in the 1990’s, it became recognized as enterprise SSO (ESSO) and later evolved into browser-based plugin or web-proxy methods known as web access management (WAM). IT’s focus was on integrating applications exclusively within the network perimeter. However, as enterprises shifted toward cloud-based services at the turn of the century and software-as-a-service (SaaS) applications became more prevalent, the domain-based SSO mechanisms began breaking. This shift created a new need for a secure connection to multiple applications outside of the enterprise perimeter and transformed the perception on SSO. Large-scale Internet providers like Facebook and Google also created a need for consumer-facing SSO, which did not previously exist. Prior to these social networks, SSO was used only within the enterprise and new technology was created to meet the demands of businesses as well as securely authenticate billions of Internet users. There are many SSO options available today that fit all types of use cases for the enterprise, business and consumer, and they have been divided into three tiers—Tier 1 SSO being the strongest and most advanced of the trio. Tier 1 SSO offers maximum security when moving to the cloud, the highest convenience to all parties, the highest reliability as browser and web applications go through revisions and generally have the lowest total cost of ownership. 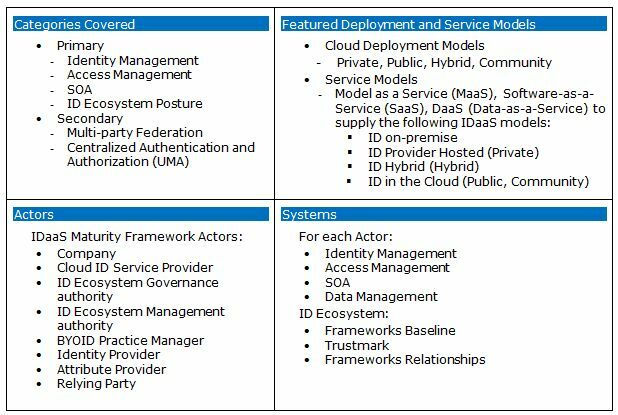 Tier 2 SSO is the mid-level offering meant for enterprises with a cloud second strategy. Tier 3 SSO offers the least amount of security and is generally used by small businesses moving to the cloud outside of high-security environments. The defining aspect of Tier 1 SSO is that authentication is driven by standards-based token exchange while the user directories remain in place within the centrally administered domain as opposed to synchronized externally. Standards such as SAML (Security Assertion Markup Language), OpenID Connect and OAuth have allowed for this new class of SSO to emerge for the cloud generation. Standards are important because they provide a framework that promotes consistent authentication of identity by government agencies to ensure security. 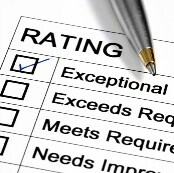 These standards have become such a staple in the authentication industry that government agencies like the United States Federal CIO Council, NIST (National Institute of Standards and Technology) and Industry Canada have created programs to ensure these standards are viable, robust, reliable, sustainable and interoperable as documented. The Federal CIO Council has created the Identity, Credential, and Access Management (ICAM) committee to define a process where the government profiles identity management standards to incorporate the government’s security and privacy requirements, to ensure secure and reliable processes. The committee created the Federal Identity, Credential, and Access Management (FICAM) roadmap to provide agencies with architecture and implementation guidance that addresses security problems, concerns and best practices. Industry Canada’s Authentication Principles Working Group created the Principles for Electronic Authentication which was designed to function as benchmarks for the development, provision and use of authentication services in Canada. As enterprises continue to adopt cloud-based technologies outside of their network perimeter, the need for reliable SSO solutions becomes more vital. Vendors that support these government-issued guidelines offer strongest and most secure access management available today. Since the establishment of SSO, the technological capabilities have greatly advanced and SSO has been forced to evolve over the past few decades. First generation SSO solutions were not faced with Internet scale or exterior network access, whereas today’s SSO is up against many more obstacles. As IT technology progresses in the future, SSO will have to grow with it and strengthen its security. For instance, while SSO is the expectation for web browser applications, the emergence of native applications (downloaded and installed onto mobile devices) has hilted the necessity of a similar SSO experience for this class of applications. To address these new use cases, new standards (or profiles of existing standards) are emerging and initiatives like the Principles for Electronic Authentication will have to adapt accordingly in order to offer the best guidance possible. “Policy as a Service” – Critical for Cloud Deployments! The financial ROI of Cloud security and compliance is judged by decision makers in end-user organizations by the same measures as is done for Cloud computing in general, i.e. by how much it cuts up-front capital expenditure and in-house manual maintenance cost. However, manually translating security policy into technical implementation is difficult, expensive, and error-prone (esp. for the application layer). In order to reduce security related manual maintenance cost at the end-user organization, security tools need to become more automated. With the emergence of Cloud PaaS, it is therefore logical to move all or parts of the model-driven security architecture into the Cloud to protect and audit Cloud applications and mashups with maximal automation. In particular, policies are provided as a Cloud service to application development and deployment tools (i.e. “Policy as a Service”), and policy automation is embedded into Cloud application deployment and runtime platforms (i.e. automated policy generation/update, enforcement, monitoring). Most importantly, instead of having to specify (or buy and install) and maintain the policy models used for model-driven security on an on-going basis, application developers and security specialists can now simply subscribe to the kinds of policy feeds they require without the need to know the details of the models. The Policy as a Service provider (typically different from the Cloud provider) takes care of policy modeling, maintenance, and update. Other benefits are that the user organization does not need to be a security and compliance expert because the up-to-date policy models will be provided as a feed to them on an on-going basis, that the upfront cost hurdle is minimized thanks to the subscription model, and that there is no need by the end user organization to continually monitor regulations and best practices for changes. 2. Automatic Technical Policy Generation in the Cloud: The automatic policy generation feature of MDS is integrated into the development, deployment, and mashup tools (to get access to functional application information). It consumes the policy feed described in the previous section. Platform as a Service (PaaS) sometimes includes both Cloud hosted development and mashup tools and a Cloud hosted runtime application platform. In this case, automatic technical policy generation using model-driven security (MDS) can also be moved into the Cloud, so that technical security policies can be automatically be generated for the applications during the Cloud hosted development, deployment and/or mashup process. This is in particular the case for mashup tools, because those tools are more likely to be Cloud hosted, are often graphical and/or model-driven, and are concerned with interactions and information flows between Cloud services. If the development tools are not hosted on the PaaS Cloud, then the MDS technical policy auto-generation feature needs to be integrated into the local development tools. 3. Automatic Security Policy Enforcement in the Cloud: Policy enforcement should naturally be integrated into the PaaS application platform so that the generated technical policies are automatically enforced whenever Cloud services are accessed. As described in the previous section, policies are either generated within Cloud using hosted MDS and PaaS development tools, or are uploaded from local MDS and development tools. How policy enforcement points are built into the PaaS application platform depends on whether the PaaS application platform (1) allows the installation of a policy enforcement point (e.g. various open source PaaS platforms, e.g. see case studies below), (2) supports a standards based policy enforcement point (e.g. OASIS XACML), or (3) supports a proprietary policy enforcement point. 4. Automatic Policy Monitoring into the Cloud: Policy enforcement points typically raise security related runtime alerts, especially about incidents related to invocations that have been blocked. The collection, analysis and visual representation of those alerts can also be moved into the Cloud. 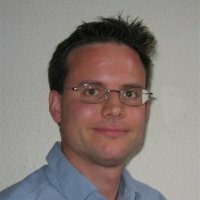 This has numerous benefits: Incidents can be centrally analyzed for multiple Cloud services together with other information (e.g. network intrusion detection). Also, an integrated visual representation of the security posture across multiple Cloud services can be provided, integrated incident information can be stored for auditing purposes, and compliance related decision support tools can be offered as a Cloud service. 5. Automatic Updating: The described model-driven approach enables automatic updates of technical security policy enforcement and auditing whenever applications and especially their interactions, change. The same automation is possible when security policy requirements change. Publications about this can be found in the ISSA Journal October 2010 and on IBM developerWorks. Contact me if you would like to know more information about Policy as a Service. It is also important to note that model-driven security (MDS) does not necessarily rely on model-driven development to work – even though it relies on application, system, and interaction models (so-called “functional models”) to achieve significant security policy automation. The traditional MDS approach is that these functional models ideally come from manually defined application models authored during model-driven development (e.g. UML, BPMN). But this is not necessary. We have designed an additional solution for our OpenPMF where the functional models are in fact obtained from an IT asset management tool that is part of our partner’s (Promia, Inc.) intrusion detection/prevention product Raven. This works well, and enables the use of model-driven security in environments which do not support model-driven development or where model-driven development is not desired. As described in this previous blog, we started the process of collectively building a standardized profile that Cloud Providers can use to describe their services, hosting facilities and other factors that are important to client, so they can make like for like comparisons. We’re very lucky in that my first amateur effort has thankfully been superceded with a much more in-depth version. Feel free to download and use to define your own service provider profile, and be sure to let us know how it can be improved – Join in and post feedback comments on this discussion thread in our Linkedin group.